First off, let me just say, I don’t really do chick flicks. I haven’t seen “The Fault in our Stars”. I did not really care for “The Notebook”. 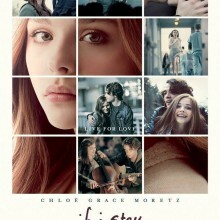 But I must say, “If I Stay” just worked for me. Most critics have stated that it follows the typical drama storyline. I get that. However, a few things set it aside from the others for me. First of all, Chloe Grace Moretz was absolutely wonderful. She put on an excellent performance. But she wasn’t the only one. Jamie Blackley was also very impressive in my opinion. Also, there is one element to this story that other ones don’t necessarily have: the supernatural. WARNING: SPOILERS AHEAD. This story starts off pretty happy. Fun-loving family, happy couple, the whole nine yards. But then, a snow day occurs and the family decides to go visit the grandparents. The icy roads cause a car accident in which Chloe Grace Moretz’s character, Mia Hall, and her entire family is injured and in critical condition. That’s when Mia has an out of body experience. No one can see or hear her, and she works her way to the hospital. She finds out that her mom had died at the scene, her father had died on the operating table, and her younger brother, Teddy, had died later on from a brain injury. She then has to make the choice to live or go ahead and die and rejoin her family. Of course, in the end she elects to live. I thought this element is what made the film. For me, it really added something extra to it. Now, during the flashback sequences, there was of course a lot of mushy teenage drama stuff, and honestly the whole hospital element kind of makes up for it. So, the main thing I’m combining here is the supernatural element and the sensational acting. I definitely hope to see a sequel, which is possible because this film is based off of a novel by the same title by Gayle Forman. Forman did write a sequel, called “Where She Went”. I’m very curious to see if this becomes a reality. So all in all, despite receiving negative to mixed reviews from critics, I definitely give this a thumbs up. + The element of the Supernatural. + Story moves at a good pace, keeping you interested. - Enforces the chick flick stereotype in parts.